Defintion: For those of you not familiar, Deep Blue Sea (1999) is a horror movie about a group of scientist doing research on some super-intelligent sharks. Kathryn is from West Palm, Florida, and is by far one of the coolest people I have ever met. 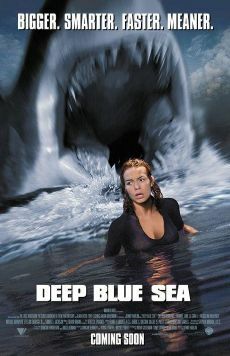 Origin: Kathryn told the following story at the TGI Friday's in West Palm while I was there: "...so we had rented Deep Blue Sea at least 3 times, and everytime we rented it, no one would pay attention. So I made up this drinking game, and it worked. We watched the whole thing." Everytime someone says the word "research," take a shot. Everytime someone says the word "shark," take a shot. Everytime someone dies, take two shots. WARNING: This game is not recommended for anyone to play, ever. Alcohol poisoning will result. Seriously, folks, this page is a complete joke. Sure, Kathryn's friends played it, but by the end of the movie, they began slurring out phrases like, "Whoa! There are threeeeee Samual L. Jackson's in this movie!" and "Hey, Kathryn, you guys must be rich to have so many TV's!" Playing this game, would make you go blind. On the plus side, I bet the movie is far more entertaining that way. Game: If you actually wanted to play a toned-down version of this game, replace the word "shot" with "sip." ...but you knew that.